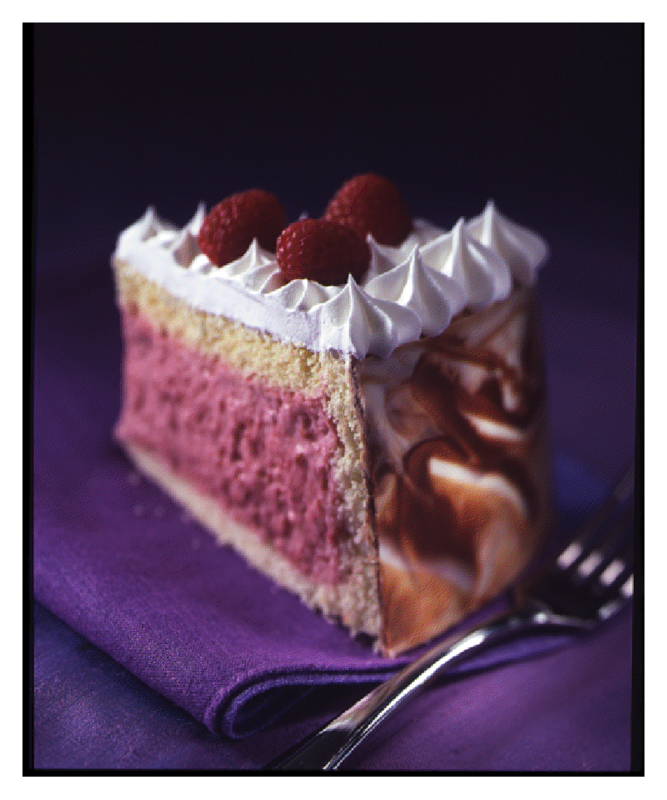 This cake is comprised of a thin vanilla sponge shell filled with a hot pink raspberry mousse. The entire cake is surrounded by a crisp, marbled chocolate band and topped with whipped cream. It is elaborate looking, but relatively easy to make if you are an adept baker. If you are looking for what I call a “project” dessert to challenge yourself and impress your friends, give this one a try. The sponge cake, which is incredibly flexible, is almost exactly the same as Alice Medrich’s from her Cocolat book, which any dessert lover should own. In fact, this whole cake was inspired by cakes that I had seen of hers. I developed this cake in 1996, which was years before we knew one another. Her recipes inspire me to this day. You can make this sponge right before assembling, or take advantage of the fact that it can be made a day ahead. The only trick with the sponge is that you must truly drizzle/dribble the liquid into the egg/sugar mixture and fold it in carefully so that it will remain suspended. If you combine it too quickly it will end up sinking to the bottom of the sponge cake, creating a rubbery layer. (It’s happened to me when I’ve rushed and I don’t want it to happen to you). You will notice that the filling includes frozen berries. This is for a few reasons – I wanted to be able to make this cake any time of year, frozen berries are reliably found in the supermarket year-round, and their quality is consistent as well. You could use fresh; just weigh them out. We did place a few fresh berries on top of the cake for the picture, but they are optional. I know, I know, this means buying frozen and fresh, which might seem a bit odd, but in the heat of the moment in the photo studio, it made sense. Once the sponge lined pan is filled with the raspberry mousse, you have another opportunity for the cake to sit overnight. (I usually bake the cake, cool it, then assemble it through this step the day before serving). I recommend using acetate (flexible clear plastic) to make the chocolate band; it will give it a nice, shiny finish and you can find it in art and craft stores. You can use the shiny side of aluminum foil, but you just risk the foil wrinkling. You can also use a piece of parchment paper, but the chocolate will not have the same sheen. Your choice. Just use the same dimensions for the strip and follow the instructions. I will work on getting a video made of this eventually so that you can see the process. For the Cake: preheat oven to 375 degrees F. Spray a half-sheet pan with pan coating, line with parchment and spray again. Also, have ready an 8 by 3-inch spring form pan and an 8-inch cardboard round. Measure out milk in a microwaveable measuring cup. Add butter and microwave on high until butter is melted. Alternately, melt butter with milk on stovetop. Set aside, keeping warm. Meanwhile, sift flour and baking powder. Place eggs, yolks and sugar in mixer’s bowl and whip on high speed using balloon whip attachment. Whip until a ribbon forms and the mixture is light, fluffy and has tripled in volume, about 5 minutes. Beat in vanilla extract. Re-sift dry mixture over egg/sugar mixture in three separate batches, folding in each batch thoroughly using a large whisk. Be gentle and retain as much volume as possible. When all of the dry mixture is incorporated, dribble in the butter/milk a little at a time, folding slowly and carefully. The liquid is heavier than the batter and if you do not fold it in so that it is suspended in the batter, it will sink and create a rubbery layer in your sponge. Spread the batter into the pan, using an offset spatula to spread evenly. It will be thin. Bake for about 8 to 10 minutes, rotating front to back once during baking time. The cake should spring back to the touch, a toothpick will test clean and it will just be beginning to turn golden. Do not let it over-brown or it will loose its flexibility. Place on wire rack to cool. Use immediately, or wrap in plastic (still in pan) wrap and store at room temperature for 24 hours. For the Mousse: pour defrosted raspberries and any juice into bowl of food processor fitted with metal blade. Turn on machine and process until berries are pureed and fruit is completely smooth. The metal blade will chop up some of the seeds. It is not necessary to strain. This may take as long as 1 to 2 minutes. Pour into large bowl. Pour 1/2 cup juice or water into large microwaveable measuring cup, sprinkle gelatin over liquid, stir to combine. Let sit to soften for 5 minutes. Add remaining 1/4 cup liquid and sugar. Heat in microwave until gelatin is melted and sugar is dissolved, stirring once or twice. Alternately, heat in small pan on stovetop. Add melted gelatin mixture to raspberry puree. Place bowl with puree over another bowl filled with ice and cold water and stir until thickened. This may take as long as 30 minutes. Stir often until puree is as thick as raw egg white. Meanwhile, unmold cake: use knife tip to loosen all edges. Lay out a clean piece of parchment on your work surface and invert cake onto it. Remove pan and very gently peel off baked-on parchment from cake. Line cake pan with sponge as follows: cut out two 8-inch rounds, as close to one long side of the cake as possible. (Use bottom of 8-inch pan as a guide). Cut the remaining cake into 2 1/2-inch strips running the length of the pan. Place one round in the bottom of the spring form pan. Arrange the strips around the sides, cutting to fit. The ends should fit snugly, but don’t worry too much because the mousse will eventually hold it all together. Reserve the second round. Whip the cream until soft peaks form and fold thoroughly into cooled raspberry puree. Pour into sponge shell and top with remaining round. Wrap with plastic wrap and refrigerate at least 4 hours or overnight, until mousse is set. Open spring form pan, unmold cake and place cake on 8-inch cardboard round. Refrigerate until needed. Make the chocolate band: have ready a 26 1/2-inch long by 2 1/2-inch wide acetate strip (see Note). Melt the white and dark chocolates separately in double boiler or microwave. Scrape into two parchment cones. Snip a medium sized opening (about 1/4-inch) from each cone. First pipe with the white chocolate in large, free-form loopy patterns all along the strip. Go over again with the dark chocolate. Using a small offset spatula, start at one short end and spread the chocolates over the acetate to cover it. The effect will be a mottled dark and white chocolate pattern. Remove cake from refrigerator and place on a flat serving plate. Pick up acetate strip from both short ends. Place the center of the strip, chocolate side in, at the center rear on the cake. Make sure the bottom of the strip is aligned with the base of the cake. Bring the two ends of the acetate towards you. The wet chocolate will adhere the strip to the cake. One short end should lay flat against the cake. The other short end should be left sticking out, about 1/2-inch. Refrigerate until the chocolate is set, at least 30 minutes. Starting with the end that is sticking out, peel off the acetate. Then, gently press the chocolate that is sticking out against the cake to seal the band. The warmth of your hands should make it flexible enough, or just wait a few minutes at room temperature for the chocolate to soften. For the Topping: place the cream and sugar in mixer’s bowl and whip with balloon whip until medium stiff peaks form. Place in pastry bag fitted with a large star tip and pipe large rosettes all over the surface of the cake. Refrigerate until serving; at least 30 minutes, or up to 6 hours. Immediately before serving, scatter the fresh berries on the top of the whipped cream, if desired. It looks hard to cut, but it isn’t. Just use a very sharp knife with a thin blade and cut into wedges.